Little Krishna's the latest rockstar on television. And he's now a Nick toon. "He's a prankster, the ideal son, ideal friend, a superhero who fights for good and evil and is a musician as well, says Nina Elavia Jaipuria, SVP & GM Nick India. The world-class animation, produced wholly in India by Big Animation Studios, will be the channel's first foray into tapping local content. And if all goes well, the animation that received rave reviews at Cannes, will also see a theatrical release. For Ashish Kulkarni, CEO, Big Animation, and a fan of Disney's Lion King, animation in India has come of age and the next step is to bring Krishna to the big screen, in the next few months. The 13-part series, currently to be aired on the channel in India and the subcontinent, may be telecast globally too. What works for the epic god is he compelling storyline, which is being used across 13 episodes, apart from being an engaging, endearing character. The animation took over seven years of research, which was backed by Iskcon. The process began almost nine years ago when Kulkarni met Chanchalapathi Dasa, Vice Chairman, The India Heritage Foundation, who was looking for a production house from the US to help him animate the story. Over the next two years, the two worked together to narrow down to 130 stories, which were whittled down to 27 and finally 13, involving Krishna between the ages of five and nine. The look also took time, with over 60 stylish and cute counterparts of the little god being created, out of which one was chosen. The challenges were many. Since production houses were used to being hubs of outsourcing, most pre-production took place abroad. Recalls Kulkarni, "Most of the activities involving Krishna happened outdoors and we realized that his blue skin tone merged with with the blue of the sy and the water. That was a problem initially. We couldn't use fur for his curls, as we used that for the animals as well, so we had to go for something stylised." He adds, "In India, there was nobody who could give him his jewellery or create cloth, water, fire or a tornado. So, we brought in experienced hands like Jeoffrey Scott, five-time Emmy winner Vincent Edwards, who directed the Spiderman television series to train our staff. Now, we can do everything from moving from the idea, to script to storyboard to taking it to the screen." 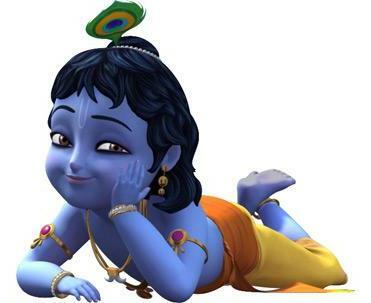 As for Nick, viewers can look out for Little Krishna memorabilia, which will include toys, books, DVDs and more!